Heading out of town for a vacation? 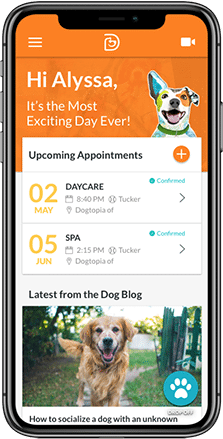 Why not give your dog a vacation of their own by boarding them at Dogtopia of Birmingham? Whether your dog needs overnight or extended care, we will ensure they enjoy busy, activity-filled days and restful nights while you’re away. 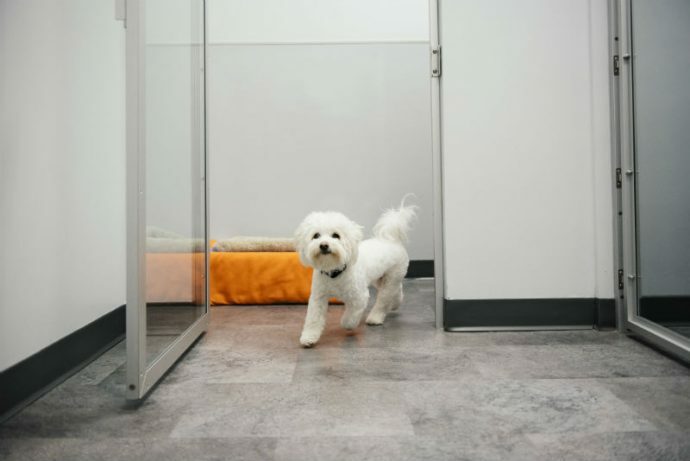 Unlike other boarding facilities, we don’t confine your dog to an uncomfortable kennel for the duration of their stay. 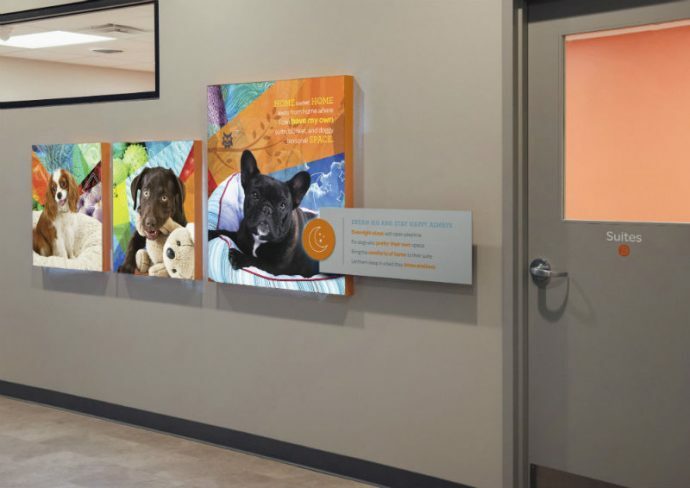 We believe that dogs are at their happiest and healthiest when they are getting plenty of exercise and socialization, which is why we offer our boarding dogs up to 10 hours of play throughout the day. 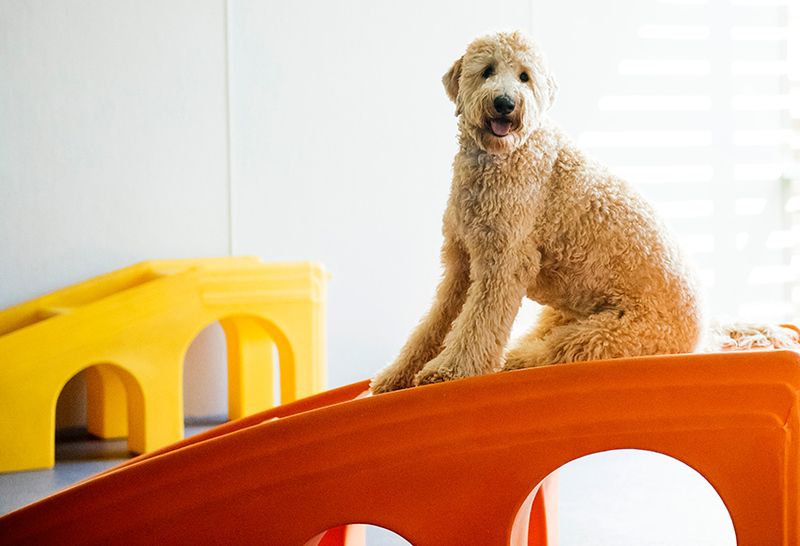 Our playrooms are separated by dog size and temperament to ensure our canine guests’ comfort. A typical boarding day starts at 7am, when the dogs engage in open play with our daycare dogs until noon, when it’s time for lunch and naptime. At 2pm, they’re back to playing until dinnertime at 7pm, followed by a resting period. They’ll enjoy another play and potty break before being tucked in between 9-9:30pm. 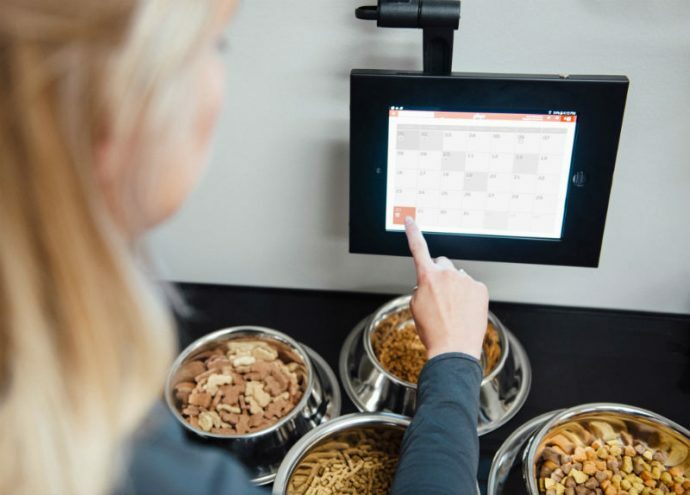 Our highly trained team makes every effort to ensure your dog is comfortable and happy during their stay. If it will ease your pup’s separation anxiety, feel free to bring bedding, a non-squeak toy, and food from home. We also offer house food free of charge. 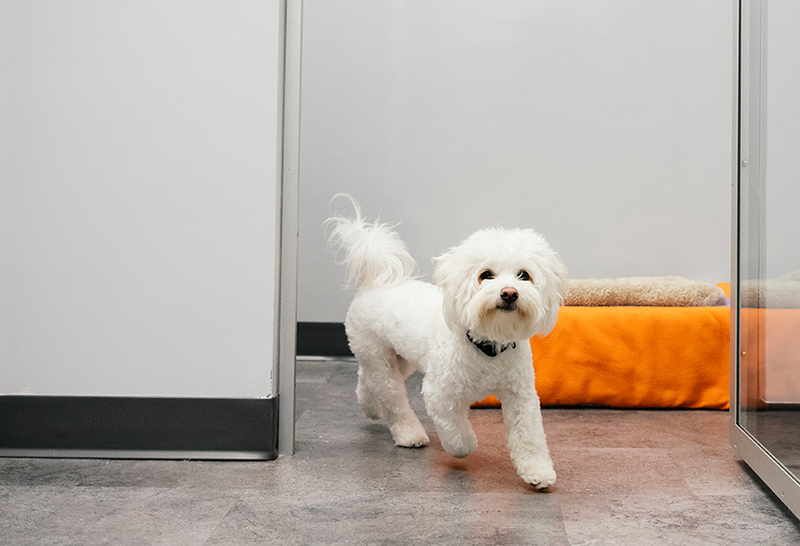 If your dog requires more space or is a crate “escape artist,” we also offer boarding suites for their comfort. Missing your dog while you’re away? Peek in on them throughout the day using our live webcams! You’ll feel better knowing your dog is having a great time with their new furry friends. While your dog is staying with us, why not take advantage of our doggy spa services? 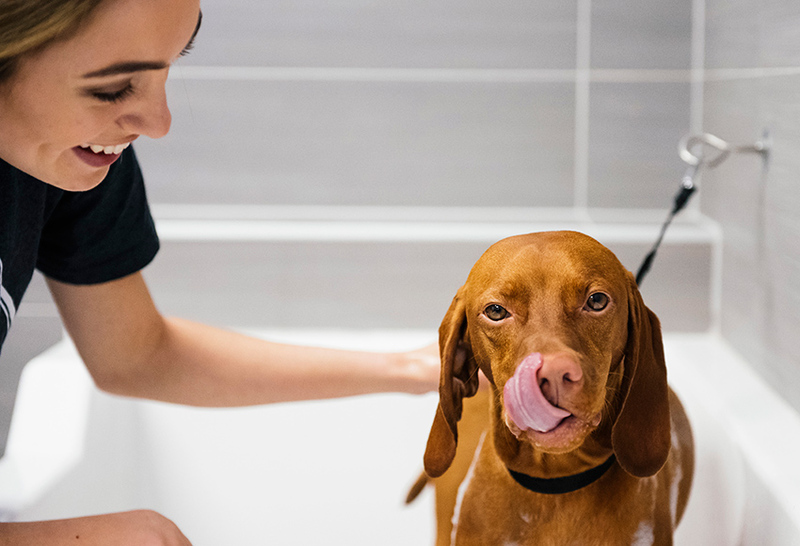 Our spa team will make sure your dog is scrubbed, fluffed, and clean when you pick them up. We care about the safety of all guests, which is why all dogs who board with us must first pass a meet and greet session with our team. This will ensure they are well-suited for our open play environment. 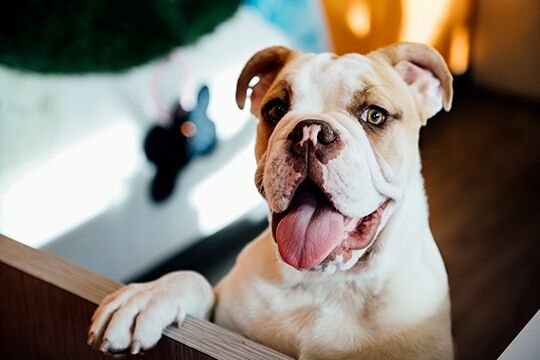 All overnight guests must also be at least three months old, spayed or neutered (if over 7 months old), current on required vaccines (rabies, DHPP and bordetella), and free of tick, fleas and communicable diseases. To learn more or to schedule your dog’s meet and greet, please fill out our contact form or call us at 248-897-0280. You can also download our enrollment form. Boarding space is limited so please contact us to reserve your desired dates. Up to 10 Hours open play + night care. Check-in anytime between Open & Closing hours. Check-out by 12 pm. Checking-out after 12 pm will result in a $33 full day of daycare fee.